Well after a quick week of development, followed by a week of letting Apple do its' thing, the HCSMANZ iPhone app has finally arrived. Best of all it's free. Currently an early release of the long-term plan for the HCSMANZ app, the app serves to keep people informed of what is taking place in HCSMANZ discussions and some further resources. 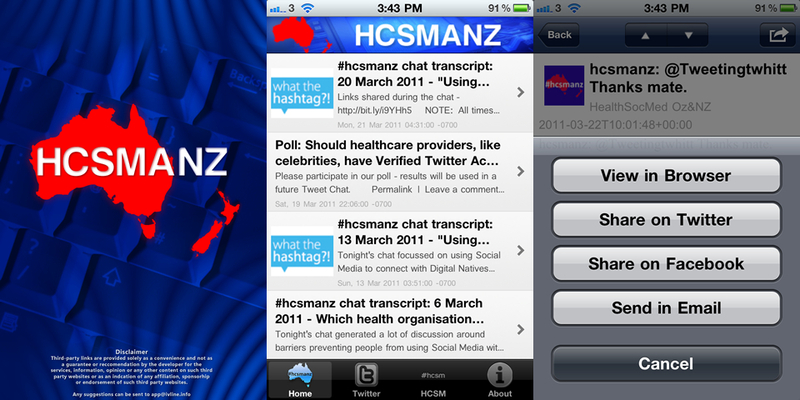 At this stage the app is drawing in feeds from the HCSMANZ blog and twitter. As such an internet connection is required to get the most out of this app. The app provides a number of different ways in which you can interact with items. Here's a look at the general interface. The app obviously still has a few areas which could be improved upon and suggestions will be taken at apps@ivline.info. For app support and more mobile apps developed by myself go to http://www.ivline.info/p/mobile-apps.html.